Just a reminder for my future-me! Nächste Woche ist es wieder soweit – die SQLKonferenz findet wieder statt. Wieder in Darmstadt, wieder mit drei Tagen voller Sessions! Dieses Jahr ist ein besonderes Jahr für die PASS Deutschland – wir feiern alle gemeinsam 15 Jahre PASS! Große Party am Mittwoch Abend ist angesagt..
Meine Session findet am Donnerstag (21. Februar) um 11 Uhr statt – ich würde mich über deinen Besuch freuen! Noch ist es nicht zu spät – Schnell anmelden und wir sehen uns nächste Woche in Darmstadt! Today morning (08:00 am Austrian time on a Sunday) I had the pleasure of presenting a session at the Virtual Power BI Days (2019-01 edition). Power BI Days are an event (mainly) organized by Jan Mulkens (t) – One day of “real” conference in Belgium on Sunday and one day of virtual conference filled with webinars. 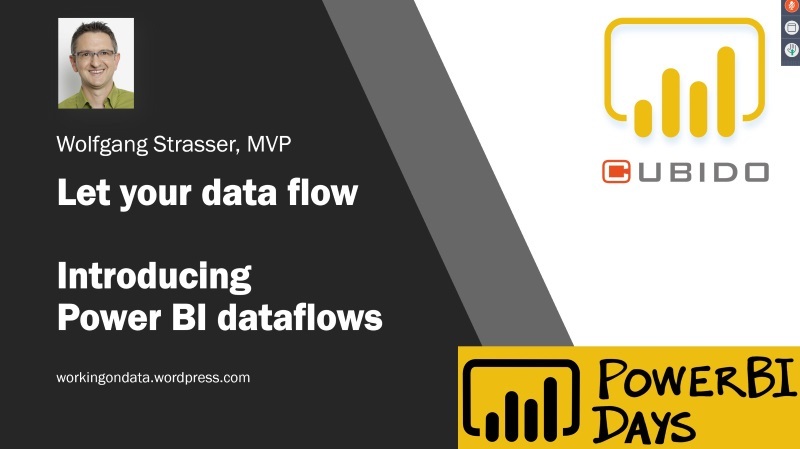 My session today focused on Power BI dataflows, the new data preparation option of PowerBI.com. Join this session if you would like to learn more about the basic concepts and especially see Power BI dataflows in action. Jan will put up a recording of the session (and the slides) at recordings.powerbidays.com. Hi and welcome to the almost last edition of my #24DaysPowerPlatform series! In today’s demo I will continue the story of Excel Online and Microsoft Flow integration. During (or better said – just before) my Power Platform sessions I encourage my attendees to fill out a short questionnaire about their knowledge of the PowerPlatform and in addition I ask them to enter their current emotions in one sentence. A Microsoft Flow that handles all the answers and a) pushes the data into a Power BI streaming dataset (and further into a Power BI dashboard) and b) writes the results into an Excel file in Sharepoint Online. The Language services provide several functions to better understand text and for this demo I will use Text sentiment analysis. The Scoring value is written back to the Excel file in the last action. In the world of data analysis and business intelligence, the part of preparing your data to work with, is seen as the most time-consuming task of any BI project. There are numbers that mention up to 80% of a total project budget for the ETL (extract, transform and load) works. In the past, these ETL tasks were mainly driven by IT professionals that produced a huge amount of data transformation logics. In the Microsoft ETL universe, SQL Server Integration Services (SSIS) packages/projects and T-SQL logic were the main choices for solving these requirements. During the last few years, the trend points into one direction: Self-Service BI! And self-service BI is mainly driven by business analysts and key users from the departments without a solid knowledge about data modeling and data preparation. Microsoft addressed these challenging task by introducing PowerPivot (the BI modeling tool integrated into Excel). A completely new story – new data modeling approach and a new formula language – DAX. The self-service trend for reporting and data modeling was definitely addressed with Power Pivot, but for the ETL part no real solution was provided..
Power BI dataflows provide the next step for re-using Power BI data preparation logic. In the past, data preparation implemented for Power BI datasets were limited to these datasets. No way of reusing logic from one dataset in another dataset! Dataflows read data from source systems, use Power Query to implement the ETL logic and store the results of these transformation steps in entities (you can also call them tables). Intuitive authoring: dataflows are created using Power Query- the tools that millions of Excel and Power BI users are already familiar with. Auto Orchestration: Dataflow authors do not have to think about the right order of dataload, dataflows are supposed to handle it in the right way (let the future prove if this is right). Common Data Model (CDM): dataflows support the Common Data Model – you can use standardized entities, extend them or create your own entities to store dataflow results. See my blog post for an explanation of the CDM! Announced in December, dataflows can now be even more deeply integrated with other Azure data services. You can choose to store dataflows data in your Power BI environment OR you can select to use your own Azure Data Lake Storage. And with the second approach, you can exchange data and work together with other data analysts/ data scientists! Is it a Premium only feature? NO – it’s PRO and Premium! Especially the Dataflows – Resources and the FAQ page are highly recommended readings! Be (data) prepared and let your data flow! Hi & Welcome back to #24DaysPowerPlatform! November 2018 can go into the books of (Power BI) history as one of the major updates and extension months for Power BI. On member of the Power BI team – Matthew Roche introduced the hashtag #Powervember and proposed to use it whenever a new Power BI feature was announced in November 2018.